While December’s Star Wars: The Force Awakens will jump ahead 30 years after Return of the Jedi to see how the denizens of that galaxy far, far away are doing, 2016’s Star Wars: Rogue One is taking fans back into prequel territory by following the Rebel Alliance’s battle with the Empire pre-A New Hope. Despite the secrecy surrounding Lucasfilm’s first so-called Anthology film, one thing that’s clear is that the film will include almost all original characters. However, now we can count on a certain heavy breathing, Dark Lord of the Sith popping his head in. Birth.Movies.Death. 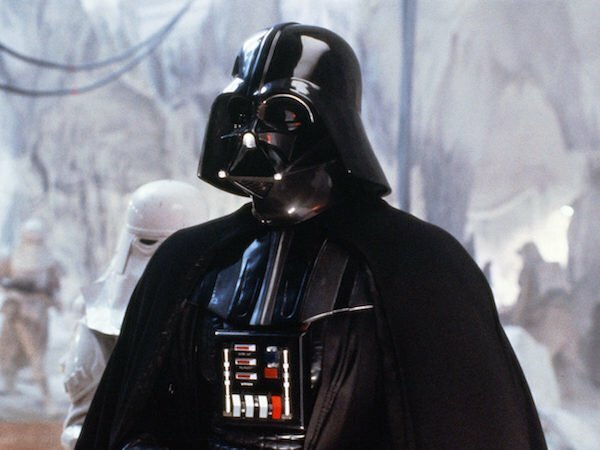 reports that Darth Vader will have a big presence in the spinoff, but stopped short of calling him the main antagonist. Instead, the Sith Lord is expected to be working behind the scenes, and will be seen via display screens and holograms. It’s also unclear whether the main protagonists will run into Vader during their adventures, though the Force help them if they do. Since this film takes place during the height of the Empire’s power, this means we’ll be seeing the badass Vader who won’t take incompetence from anybody, so I’ll be disappointed if we don’t seem him telekinetically choke at least one person. While it’s hard to imagine anyone other than James Earl Jones voicing the cyborg villain in a theatrical project, the article didn’t mention whether the actor will reprise the role or not. After meeting his demise in Return of the Jedi, Vader’s last live-action appearance was at the end of Star Wars Episode III: Revenge of the Sith, with Jones returning to voice the character and Anakin Skywalker actor Hayden Christensen actually in the black armor. Jones recently reprised Vader in the Star Wars Rebels two-part Season 2 premiere, and cameoed as the character in the extended Season 1 premiere that aired on ABC last year. Although he still sounded intimidating and cold, you could tell that his voice isn't quite the same as it was in the late ’70s and early ‘80s, which is understandable given to his advanced age. We’ll have to wait and see whether Lucasfilm wants to bring Jones back for Rogue One or hires someone new to fill his shoes. Star Wars: Rogue One follows a group of Rebel soldiers that unite on a daring mission to steal the Death Star plans. The cast consists of Felicity Jones as the lead hero, Diego Luna, Ben Mendelsohn, Riz Ahmed, and Forest Whitaker. Disney and Lucasfilm showed the first teaser trailer for the film at Star Wars Celebration in April, and it’s been described as darker and more grounded than its predecessors. With filming reportedly already begun, fans can catch Star Wars: Rogue One in theaters on December 16, 2016.